This was one of the best parts of our trip. How often do you get to walk on a glacier and then go inside. All of the guides were fantastic and extremely knowledgable. They took safety very serious. Will go again when we go back. A must see on any trip to Iceland! We were picked up n Reykjavik by the cpmpany Reykjavik Sightseeing and our guides Amelia and driver Danny were great. They had everything well organized. They then transferred us to our guides Edith and Hekla for our ride up the glacier in a converted military vehicle. The ride was exciting and provided some nice views of the mountain and valley. The ice cave is an amazing piece of planning and engineering. You need to wear boots or they will provide them for you, and they give you crampons to put over them. You need to be comfortable being enclosed and walking on ice, the crampons prevent slippage. The cave is beautiful shades of blue. The guides explained the layers and how the cave was created. I really enjoyed this tour. Would like to say that it was a great adventure and a wonderful trip. Our guide in the cave sang a song for us to hear the acoustic in the ice chapel. We loved the ravens Huginn and Muninn. Walking on and in a glacier is an amazing experience! Enjoyable trip with entertaining tour guide minibus a little cramped. The team at the ice caves were brilliant. Fantastic day out. The caves were amazing as was the trip up the glacier in the ex army vehicle. Guides for ice cave excursion were fantastic and very friendly and informative. This trip was 5 star plus, worth of money. A life time experience. Must congratulate to the Organiser who built this cave and allow the tourist to understand Glacier on minimum cost. Simply magical, especially when our guide sang, in the chapel! 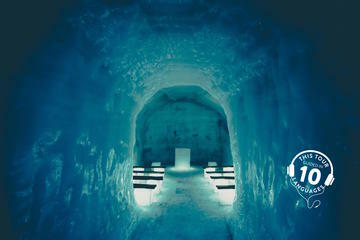 If you are going to Iceland, I wouldn't miss the Ice Cave. That being said, know that it is a man-made cave because real ice caves are too dangerous to enter. Also it is the largest form of pollution in Iceland. It is still incredibly beautiful and it is going to be there whether you take the tour or not, so you might as well go in. It is quite the experience. One piece of advice. Do not wear transition glasses on the ride over! My glasses turned very dark in the truck and when I walked into the cave, due to the cold, they would not lighten and I couldn't see. I thought I would have to miss the tour because I am blind without them. Luckily, I had electric gloves and put them in and finally they cleared up enough for the tour!!! Great tour. We had very nice, friendly and knowledgeable guides. The glacier itself was one of the best excursions we had on our week long trip to Iceland. The ride up and back to the glacier was fun! A few of our passengers were a bit nervous on the bouncy ride, but our driver explained the nature of the road/trail we were taking. The side trip to anothe4 waterfall and stone gallery were very interesting as well. Since we went in December, it was very cold, snowy and windy at the top of the glacier, but inside was fine.we did not need any outerwear other than what we were wearing for December.